As regular readers of this blog will know, I have been decidedly less mobile of late, and this looks set to continue for the foreseeable future (https://hannahbarhambrown.wordpress.com/2014/11/27/i-got-issues-with-my-tissues/). Considering that I was the last kid picked for EVERYTHING in PE, it’s possibly surprising that I found myself really missing exercise post-wobbliness. But I was actually pretty active beforehand, if only as a result of my own stubbornness. When my brother died a year ago, I had to get up and do something (seeing a theme here?! ), and so signed up for a 10k, then a half marathon. I knew I had dodgy knees, but if it was running or swimming, then my water issues and inbuilt lack of buoyancy was going to push me to running everytime. Training was a nightmare, I lived in kneebraces on and off for about a year, and now I’m honestly not sure whether I’ll ever get back to a normal level of function legwise without daily painkillers. My Rheumatologist was right to look incredulously my way when I met her afterwards. It was probably stupid. But my team of runners and I raised £12,000 for the BHF (never too late to donate folks – oh, go on! http://bit.ly/RunningForGareth), and I felt like I managed to make something positive out of something terrible. So it was arguably worth it. As a teenager, I was lucky enough to attend a school with wheelchair access, and thus have a number of mates with mobility problems (which has possibly helped my subsequent transition into the land of the wobbly-types), and some of these guys started a wheelchair basketball team. At this point, they wanted a girl or two on the team, and due to a shortage of wobbly ladies, I got the gig. I really loved it, and seemed to be reasonably good, but life and A Levels got in the way, so I had to give up. Ten years later, life is still in the way (one day, I’ll get a proper job), but I needed a form of exercise that wasn’t going to lead to further damage of my stomach lining by drugs, and so found a local team, The Brixton Ballers. Fair to say, I’ve entered as the grandma of the group at 27, and am slowly learning how to respond when young people call me things like ‘fam’ and ‘blud’ (polite smile and roll away swiftly, generally). I like to think I’m pretty good, though whether that’s a result of inbuilt talent or sheer stubbornness, I couldn’t possibly say. At the end of my first training session, the coaches were very keen to check I’d enjoyed it. Frankly, I was holding back tears of happiness at being able to work up a sweat and not feel sore, or like I was holding other people back. So it was with some trepidation that I watched the #ThisGirlCan advert. I wanted to watch it and feel empowered. I am a Feminist (in so far as that I don’t want my genitalia to mean my opportunities are any less than that of my colleagues), and I am all for encouraging women to exercise and not feel held back by the idea of getting hot and sweaty. But in 90 seconds, I didn’t feel represented. Because all those girls could. Those girls could do a zumba class, sweat dripping, attitude exuding from every pore. But this girl can’t. Those girls could swim a few lengths having determinedly rearranged their cossie on the way out of the changing room. Last time this girl tried to swim 5 lengths, she had to spend the rest of the day in bed, as the drugs just couldn’t touch it. Those girls could play football, kick a ball hard and not worry about dislocating their ankle. This girl can’t. 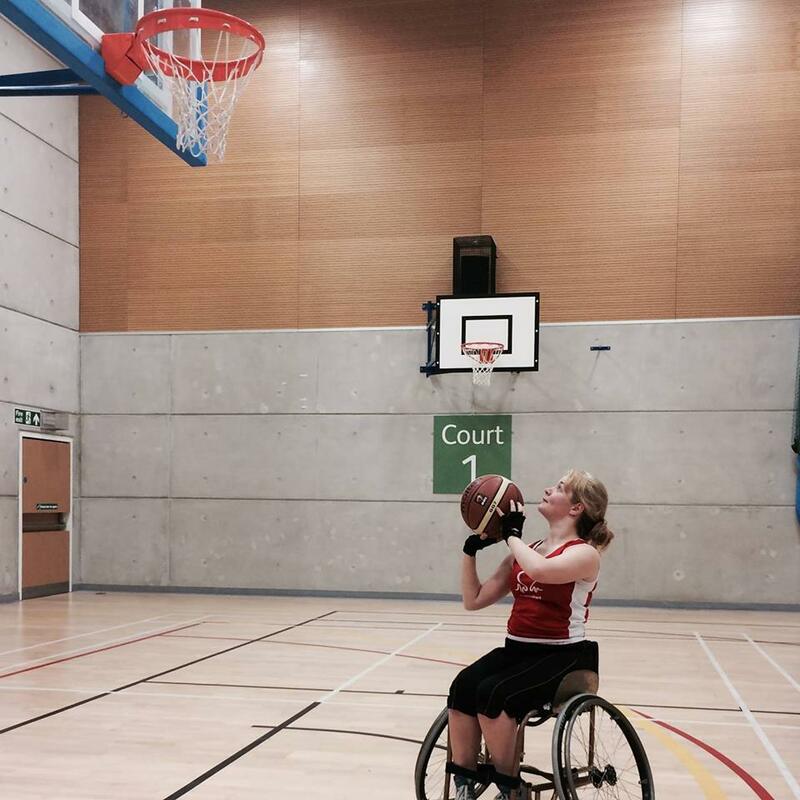 I play wheelchair basketball aged 27, having had the chance to do ‘able-bodied sport’ first. I’m confident, occasionally gobby, and having grown up with a wobbly mum and wobbly friends, I knew I could find something suitable. But young, disabled women and girls will see that advert, and they are not (except for a split second shot of a lass with Down’s Syndrome) represented. What in that advert encourages them to go out and make what is arguably a bigger change and take up a sport? Diddly squit. Yes, it will always be a struggle to represent every woman in 90 seconds. But is it really so hard to find some women in wheelchairs to feature? I’m not asking for 45 seconds. But ten would be nice. Some acknowledgement that we exist. Because you know what? #ThisGirlCan throw the same height basket from sat in a chair as Michael Jordan threw on two legs, and she can’t jump in the chair. 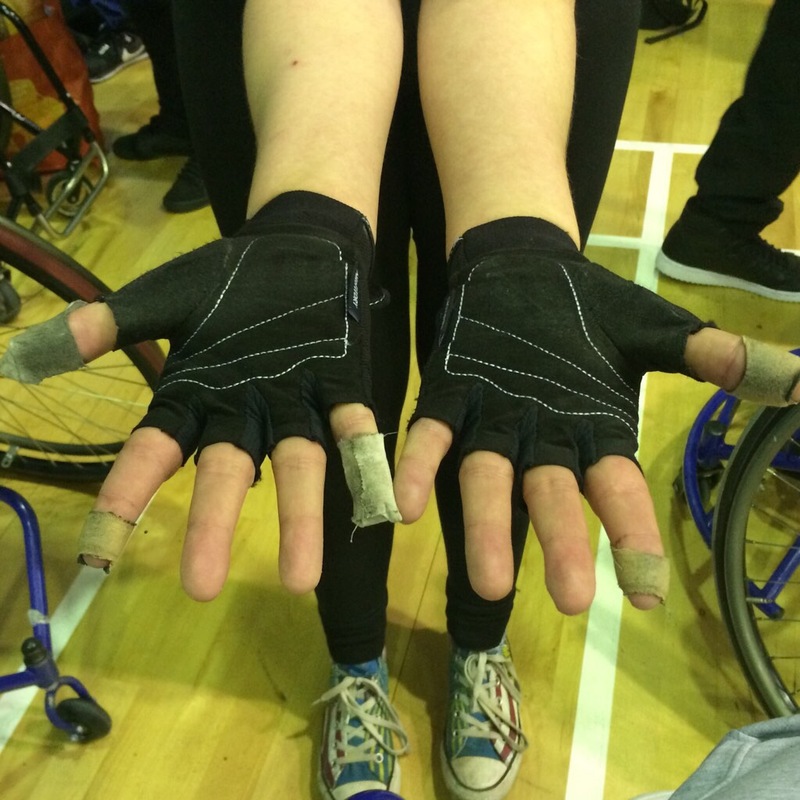 #ThisGirlCan spend 3 hours sprinting up and down a court in a chair so hard that the pads of her fingers and thumbs lose most of their skin. #ThisGirlCan dribble a ball whilst using the same hands to push herself down the court (and not in circles). This Girl hopes that these skills will be supported more than once every four years, when the Paralympics come round again. This Girl would like young women with disabilities to be actively encouraged to take up sports without having to search them out herself, or trek halfway across London on public transport (which we all know is not exactly wheelchair-friendly) late at night. All This Girl wants is to feel that her and her mates are just as valid as those on two feet. And at the moment, this Girl really doesn’t. Dear Hannah, my name is Jennie and I am Chief Executive of Sport England, which commissioned the This Girl Can campaign. I wanted to write to you myself because I have an adult stepson with EDS (and POTS). As well as Ruby, the swimmer with Downs, by now you might have seen one of the posters which accompanies the TV ad (which is on 5,000 sites across England) which features a wheelchair tennis player – not basketball, I know, but it should help to make the point that, as you rightly say, it’s not just girls on two feet who can. In the next few weeks we will also be putting a short film on social media that gives a bit more background on Ruby’s story, and we are also commissioning some further shots for the second round of our campaign showing other impairments. We do fund wheelchair basketball too (all the time, not just in the run up to an Olympics) – if you want any more details, just drop me an email. Incidentally, my stepson writes a blog too, called The Reluctant Contortionist. It took a very long time for him to get a correct diagnosis so there are a few bits of information in it you might find interesting. Thank you so much for taking the time to write Jennie; it really is very much appreciated. I’m delighted to hear that us wheely-types are being featured. Since writing this post, the wonderful folk at the English Fed. of Disabled Sport have also been in touch, asking me to be a case study for them, and I’m obviously delighted to do whatever I can to help. I’ll check out your stepson’s blog, certainly; thanks to EDS not being the most visible of disabilities, it can be really hard to find others affected! Many thanks once again for taking the time to write. My name is Ceri. I’m Jennie’s stepson. I’m sorry to hear you have Ehlers Danlos Syndrome. It’s a frustrating condition to live with, but getting diagnosed is a positive step as there’s a lot of help and advice available to enable you to manage the condition. In case you haven’t found them already, the Hypermobility Syndromes Association and Ehlers Danlos Support UK websites are very helpful. They both also have forum pages which are a goldmine of useful information and a great way to interact with and potentially meet others with EDS. I enjoyed reading your blog. You’re managing to stay active which is the best treatment for Hypermobility type EDS, if you can tolerate it. Like you I have the Hypermobility type. As a consequence I also have POTS (Postural Orthostatic Tachycardia Syndrome). Both together can be very restricting, but I try to keep positive and concentrate on the things I can still do. Hi Hannah, I came to your blog from the Brixton Ballers and noticed you’re a fellow EDS-er. I’m moving in to the area soon and kind of want to get fit (I’m also REALLY lazy!) but I’m wondering how well basketball and dislocating joints works out for you? Trying to catch flying objects with uncoordinated jelly hands seems like a recipe for leaving a little finger on the other side of the court?! Sorry for the delay in replying to this – I’ve been manic with exams lately! I’ve been reasonably ok so far; I’ve had one dislocation so far, which I relocated on the side of the court and then I carried on. This, it turns out, was a bad plan as I also broke it. Cue 8 weeks off! Gutted. But yeah, it’s an issue, and one not to be sniffed at, but for now, one I’m willing to risk! I highly recommend you come and have a go though – I love it!